Russia has floated its new state-of-the-art nuclear-powered multipurpose submarine called Kazan as its fleet returned to Soviet-era operational levels in terms of sea patrols, according to the Russian Navy chief. “The Yasen-M class nuclear-powered submarine cruisers are some of the most advanced battleships that amassed all cutting-edge submarine shipbuilding technologies,” Admiral Vladimir Korolev, the Commander-in-Chief of the Russian Navy, said as the most advanced Russian nuclear attack submarine, Kazan – the second submarine of the Yasen-M class – was launched in the northern Russian port of Severodvinsk. Kazan was laid down in 2009 and is expected to be accepted by the Russian Navy in 2018 following sea trials. The admiral said four more submarines of the same class – Novosibirsk, Krasnoyarsk, Arkhangelsk and Perm – are now being built at the Sevmash shipyards in Severodvinsk and one will be launched as early as in 2019 while the seventh and last vessel of this project, Ulyanovsk, would be laid down in the summer of 2017. All the vessels are expected to be built by 2023, according to Korolev. Yasen-M class submarines are to replace the older Russian attack submarines of the Akula-class forming the backbone of the Russian Navy’s conventional submarine force. They are considered to be counterparts to the US nuclear-powered Seawolf and Virginia class submarines. 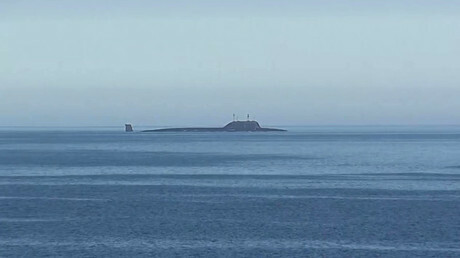 The lead vessel of the project, K-560 Severodvinsk, was laid down in 1993 but construction was completed only in 2010 due to budgetary constraints. It was accepted by the Russian Navy in 2014. The Yasen-M class vessels are 120 meters long, have a submerged displacement of 13,800 tons and can travel up to 31 knots (57 kph) while submerged. They are also designed to dive to a maximum depth of 600 meters. The submarines carry ten 533mm torpedoes and have eight vertical launching systems equipped with four Onyx and Kalibr supersonic cruise missiles each. Each ship is designed to operate independently for up to 100 days. One of the most interesting features of the new design is a large spherical sonar system which occupies its entire bow, which required that torpedo tubes be slanted and placed behind the main control compartment. 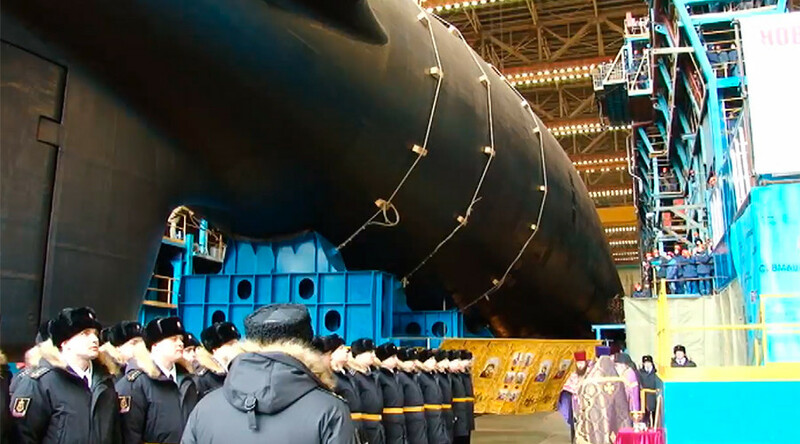 “We are creating a group of nuclear-powered submarines that will carry out missions in all regions of the global ocean and ensure Russia’s security,” Korolev said at the Kazan launch ceremony, as cited by TASS. Russian Deputy Prime Minister Dmitry Rogozin, who also attended the launch, said the new vessels would help Russia to “firmly and confidently defend its interests on the global stage.” He also emphasized the necessity of dialog in international relations adding that “this dialog should be maintained with a firm and confident voice,” referring to the importance of the nation’s defense capabilities. “Last year, we returned to the level we had before the post-Soviet era in terms of the days at sea. Russia’s submarine fleet has spent 3,000 days at sea,” the admiral said. 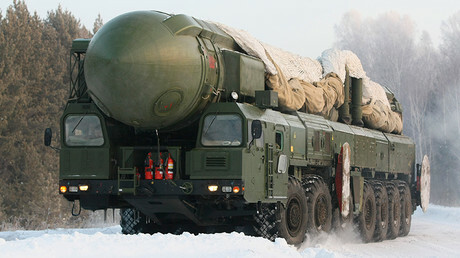 He went on to say that Russia also plans to launch another state-of-the-art submarine this summer – a nuclear-powered ballistic missile cruiser named Knyaz Vladimir. The vessel is the fourth submarine of the Borei class. With a submerged displacement of 24,000 tons, this 170-meter long vessel is designed to carry six 533mm and six 324mm torpedos, Onyx and Kalibr cruise missiles as well as 16 Bulava ballistic missiles with an operational range between 8,000 and 8,300 kilometers. According to the former head of the Russian Navy, Admiral Vladimir Vysotskiy, Knyaz Vladimir is even more advanced in terms of low noise, better weapon control systems, and higher maneuverability as compared to the first three vessels of the Borei class which are now used by the Russian Northern and Pacific Fleets. Russia’s growing state-of-the-art submarine fleet is apparently generating anxiety among the US military. In June 2016, Vice Admiral James Foggo III, commander of the US 6th Fleet, wrote in the June issue of the US Naval Institute’s magazine that “an effective, skilled, and technologically advanced Russian submarine force is challenging” NATO’s maritime dominance.